Event Index: Info. Snippets, Section Statistics. Final Results are now published, click the link on the right. The ACU Western Youth Development Squad, who made the Trial possible and provided half the workers to aid West Glos, have regular updates on their Facebook page and more info if you missed out this time. 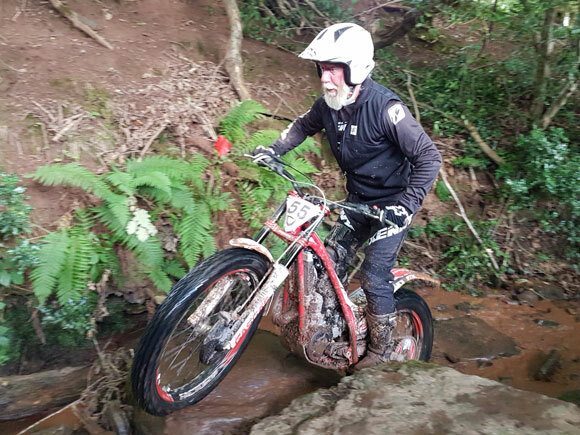 A bit of a shakey and slightly later start turned into a fully manned observer list and a nearly completely dry day - Kev Miller reported a 30 second rainstorm at the top of the course, so Goff and George were the only people to get wet that mattered, sorry guys but you had the best view. The Expert route was a new addition this year to allow some of the improved trainees to have a go at some harder stuff and Finley Belcher certainly did. Unfortunately for Ollie Goode a mechanical took him out of the youth attack leaving Gordon Brown to stop minding his daughter and have a go himself and just pip Victoria Payne by one mark. All sections were cleaned on each route at some time, bar section one ably observed by Dean Hassall's dad. When set out the day before even a novice could clean the expert route but a night full of rain changed that. 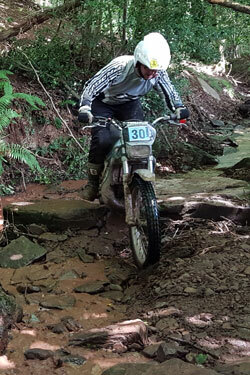 Riders who booked in for training with Si Welch were automatically allocated an entry in the Sunday trial, though some were so 'trained' out by then and needed a rest. Some had improved so much they tested their newfound skills on harder routes than they would normally ride. There were some worn out young and old bodies after that. If you had entered Sunday but couldn't ride then you should be refunded in due course. The sections at the top of the farm and took some marks but rewarded the riders with fantastic views if they were upright! We had more laps than last year and finished at a reasonable time. Any profits made at the Sunday trial get ploughed back into the Youth Development Squad.